As we head into Autumn Winter 2012, a part from the Southern hemisphere folk!, its time to take a look at the next big thing. Gents don’t fret I have not forgot you, Come back tomorrow where I will show you what you should be looking out for. 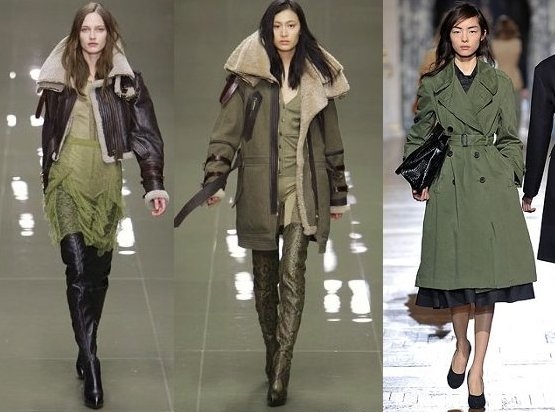 The biggest trend of A/W’ 2012 will be Baroque. Leading up to Christmas everyone will be on the lookout for that stand-out dress and statement jewellery, which is what the Baroque trend is all about. 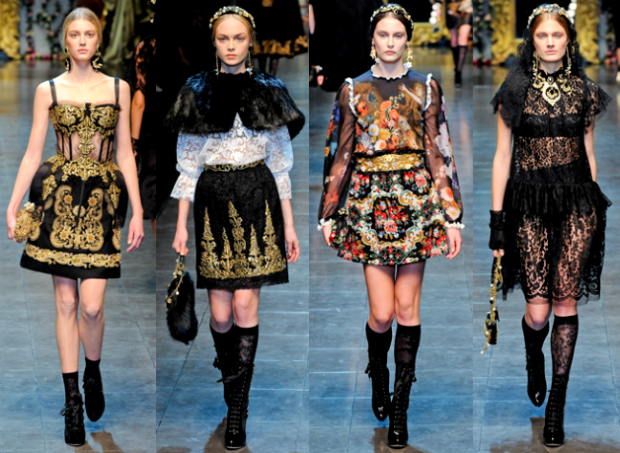 Three examples of the trend are the top image from D&G’s catwalk, & the bottom image from McQueen. Baroque is all about texture, keep colours simple Black & Gold are hugely popular, and feed nicely into other trend for this season. 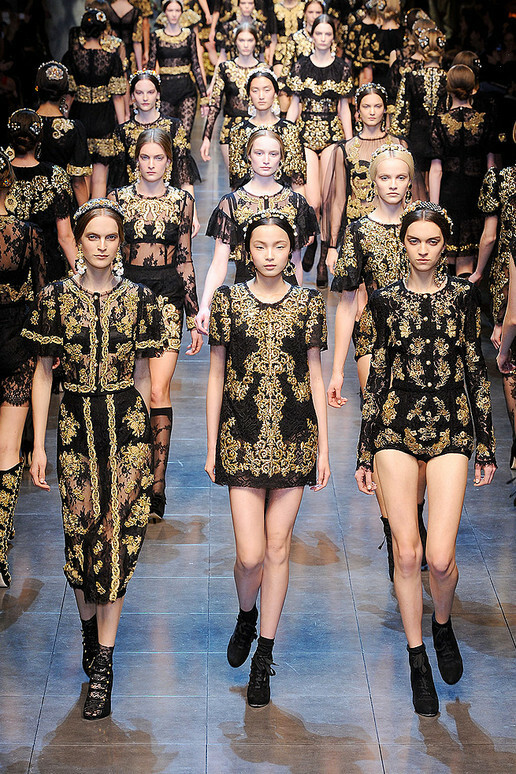 Key words to think about when buying into this trend are Lux, Metalic, Silk, Gold, Lace, Jaquard, Brocade. 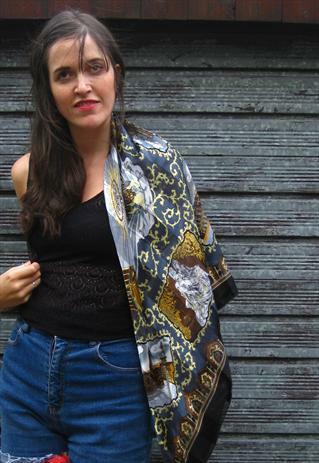 This trend is easily mixed with the Baroque trend, as seen below. 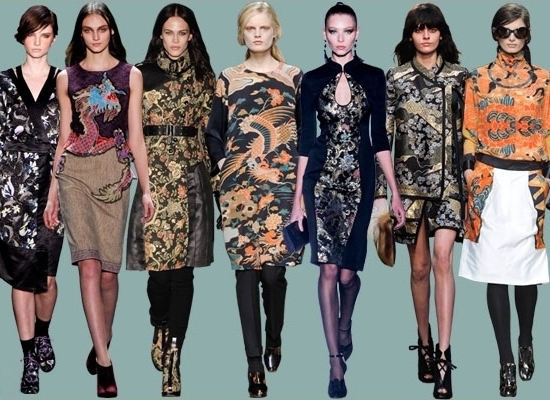 The east is a big inspiration for A/W’ 2012, so classic oriental and floral prints are essential in lux fabrics. Make sure that shapes are modern but keep the Japanese influence through accents such as a mandarin collar. Coloured leather is a big trend this season and even better in berry shades- purples & oxblood. Also, re-worked pieces in the form of camo jackets or baseball jackets with leather sleeves will be big hitters. The KEY piece is the Leather Skirt as seen above from Ada’s Attic.